This sketchbook / journal is made from 100% post-consumer recycled materials and is small enough to fit in a back pocket or purse and big enough for jotting down ideas and drawings. 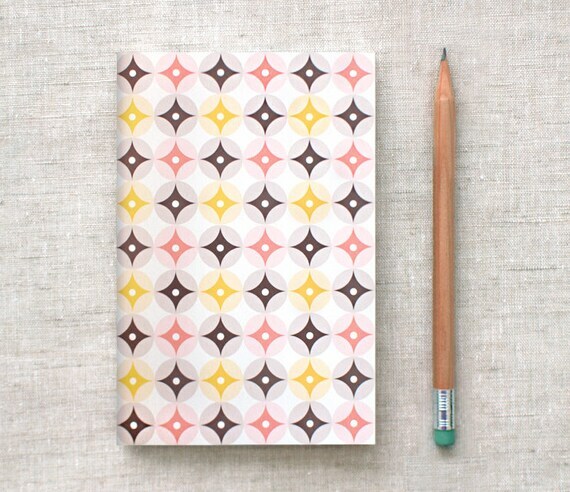 Features a diamond pattern in brown, gold, and peachy pink. Great for back to school or get a head start on stuffing those stockings! Handcrafted by me in New York. Folksy :: Buy "Recycled note book/journal "
Folksy :: Buy "Listen and Play rhymes recycled notebook"